You know what I like about the Clock King? He clearly made his costume himself. It looks like what you end up with when you're trying to throw a Halloween costume together at the last minute. Let's see...I've got some blue pyjamas...I could paint some clocks on those. And I have this green hooded cape. That doesn't really match, and I don't really need it for anything...but it might look kinda cool. I suppose if I wear these green underwear over the pjs that would sort of match the cape. It would bring it all together. I'll need some sort of mask...preferably something that almost completely obscures my vision. 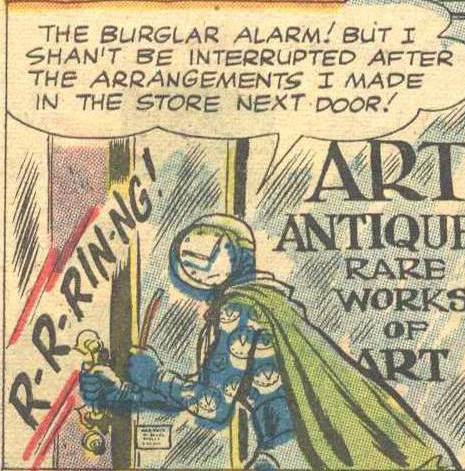 I'll just poke some eye holes in this clock face, I guess. And secure it to my head with this rubber band. Now just add the white rubber boots and long blue gloves...voila! Alright, it's not as cool as my original design...the one where I had actual working clock gears rotating on my chest...but I'm on a budget here. 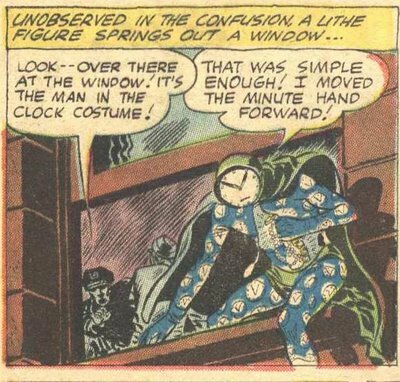 Lookin' good, Clock King! Though I'm kind of surprised that he doesn't seem to be wearing a watch.